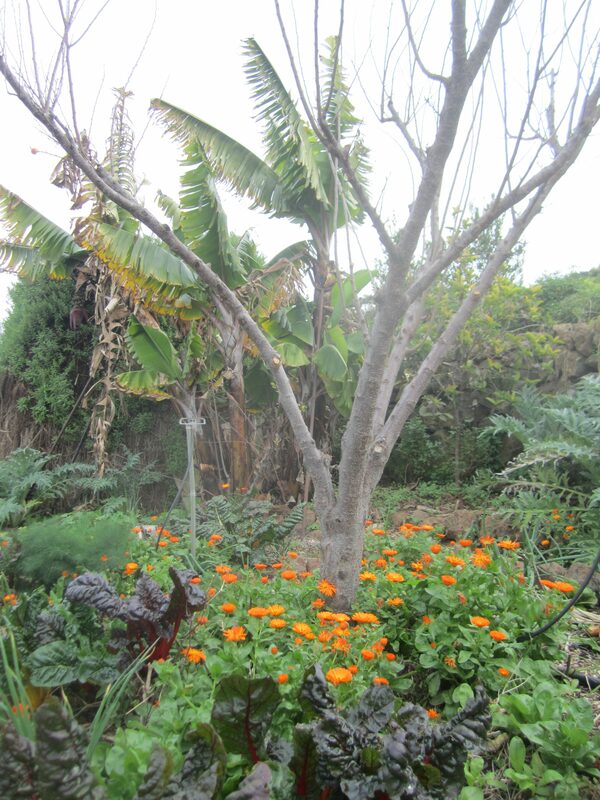 Edible forests are an extra extension of an edible garden. They are perfect spaces for therapy and contemplation; cultivated ecosystems that create healthy and safe environments; they feed us; they preserve the soil, the nutrients and the biodiversity; they are based and designed through the observation and inspiration of natural forests, with the purpose of obtaining food, restore derelict areas or areas that are at risk of desertification. 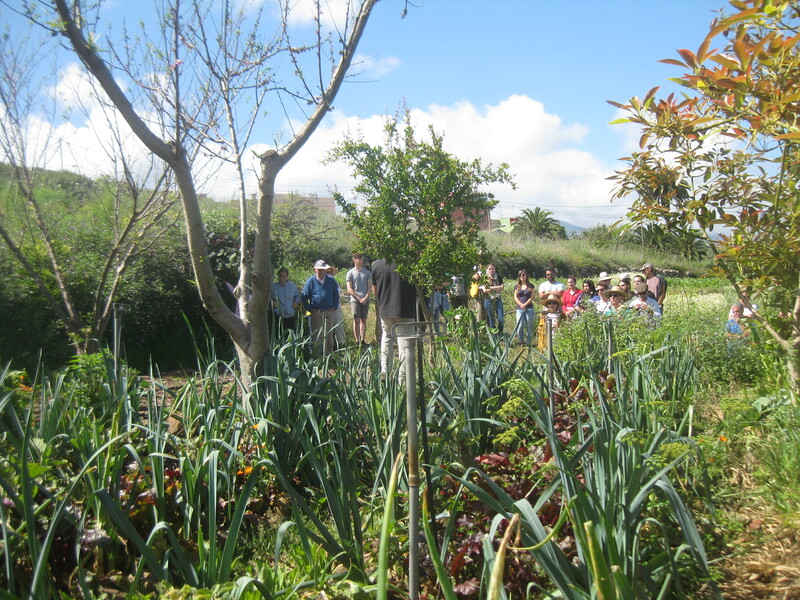 Edible forests are formed by fruit trees such as avocado trees, orange trees, cherry trees, apple trees, etc., fruit shrubs such as Barbados cherries, raspberries, cranberries, etc., and smaller plants that grow fruit such as Cape gooseberries (physalis peruviana), strawberries or pepino dulce (melon pear). There are also trees that provide us with wood, that fix atmospheric nitrogen and that harbour animals and biomass. 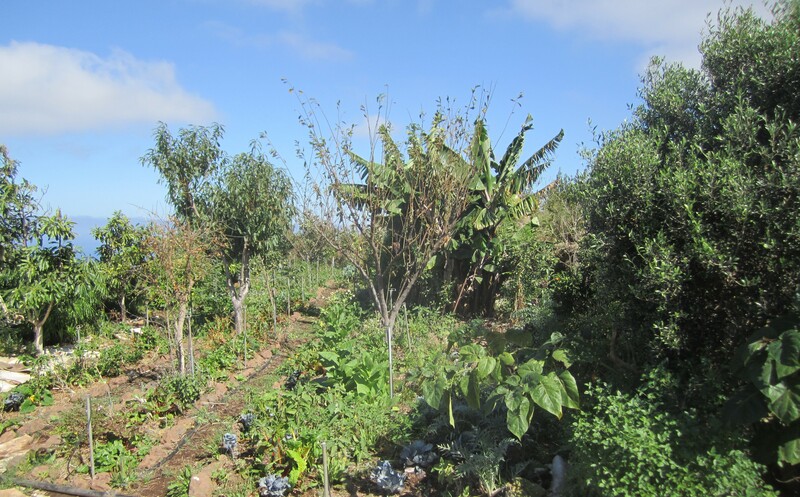 This setting creates microclimates thanks to the different heights and the variety of species that fit into the edible forest. These forests form a complex but highly efficient system; they constantly maintain a state of perfect natural harmony since their design was based on nature´s patterns. 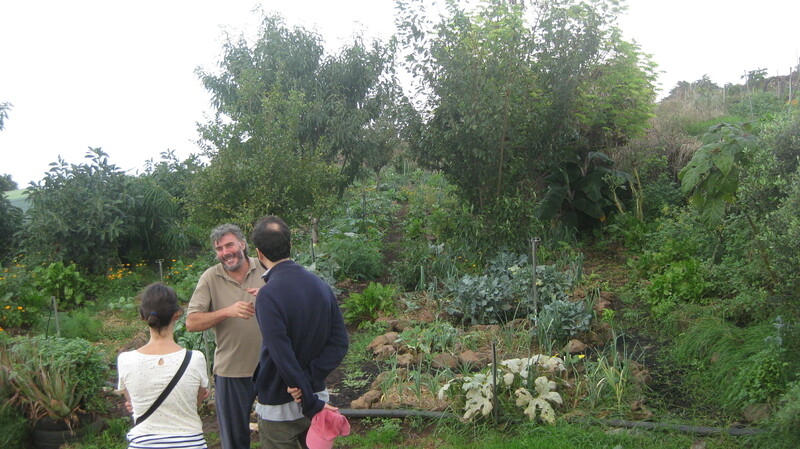 If we have enough land available, we develop the edible forests as an extension to the edible gardens. 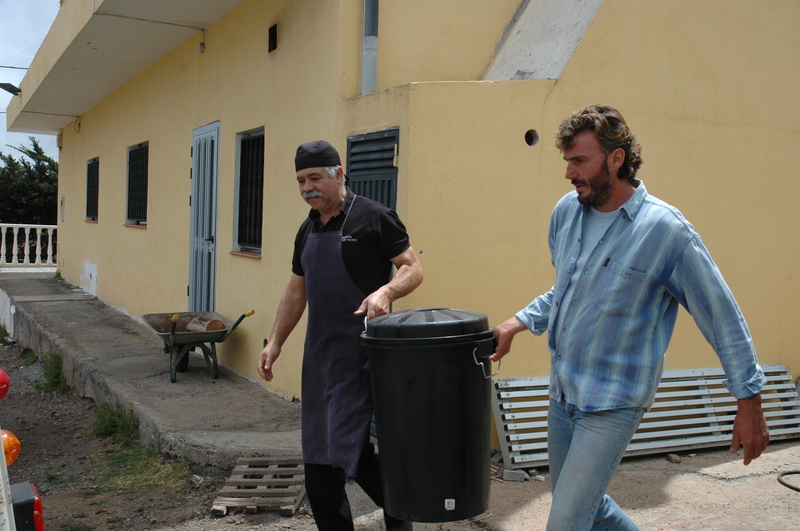 They provide an extra source of various fruits we can sell. 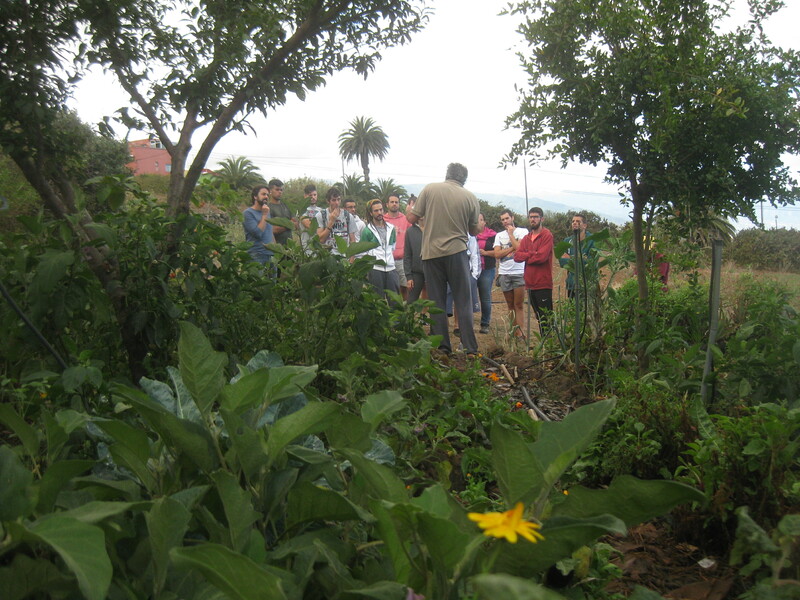 This section of the didactic unit depicts a different model developed in our project that we have named edible garden forest. 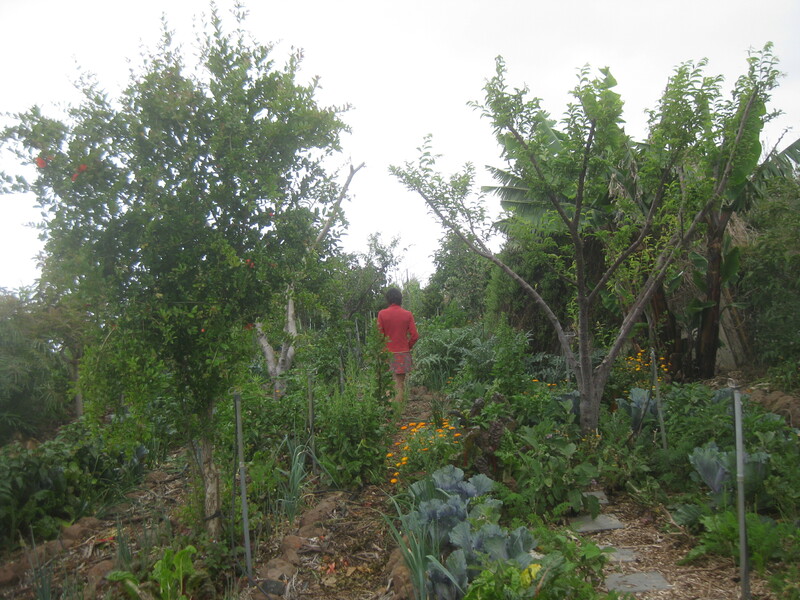 We have conceived, designed and initiated the edible garden forest model in our small plantation since we wanted to add fruit trees to our plots that at first sight seem more appropriate for an edible garden due to their size (Figure 4.1). This model manages space and productivity in the most efficient way, whilst being very therapeutic for every person involved in the project, creating a harmonic environment, which sets an example for a visiting area. In a few years we will be able to see its full therapeutic potential (Figure 4.2). 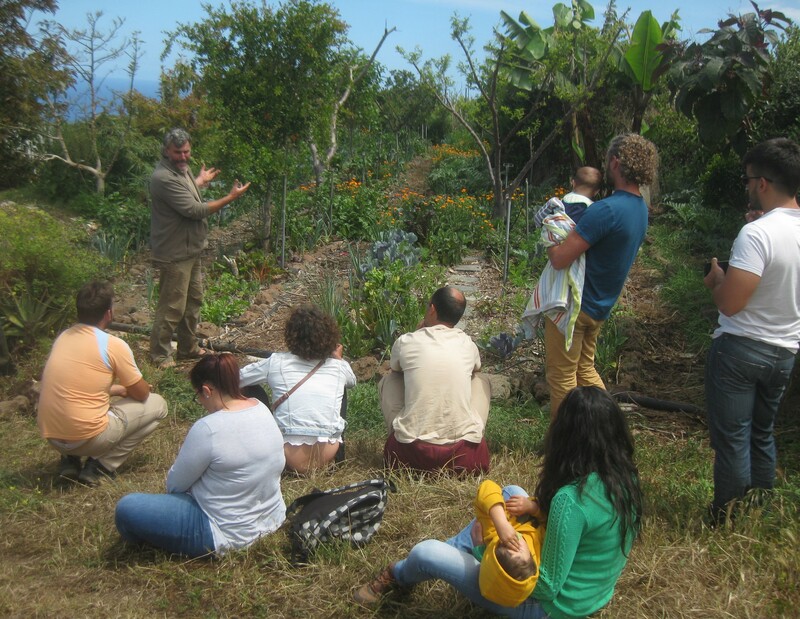 Figure 4.2 – Transformation of an edible garden forest in one of the plots of El Mato Tinto farm. 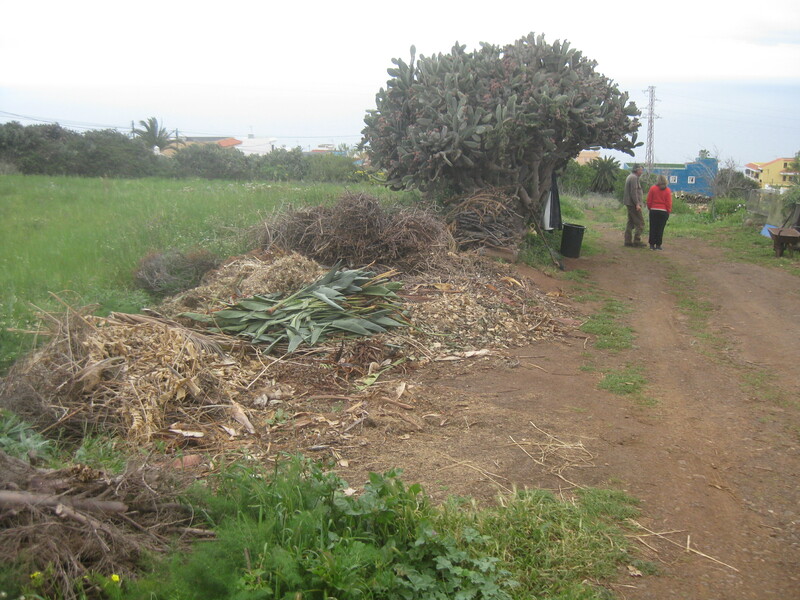 In the image on the left, taken in May 2011, we can see several parts of the plot: the beds with their mature compost and the soil´s skin (cf. Didactic Unit V) that covers them, the recently built pollinator volcano, and recently planted evergreen and deciduous fruit trees. The image on the right shows the same plot three and a half years later, in November 2014. This model derives from the combination of the edible forest and the edible garden, designed together. In order to allow the highest amount of sunlight to enter in winter, the garden forest should have the shape of the letter U or of a semicircle with the open side, free of evergreen trees, targeted towards the sun. 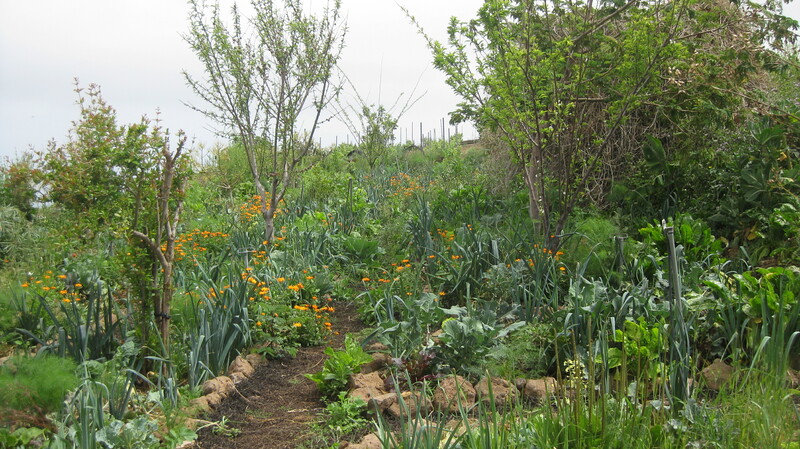 It is a garden forest where evergreen and deciduous fruit trees, bushes, aromatic plants, flowers and vegetables are mixed up together (Figure 4.3). 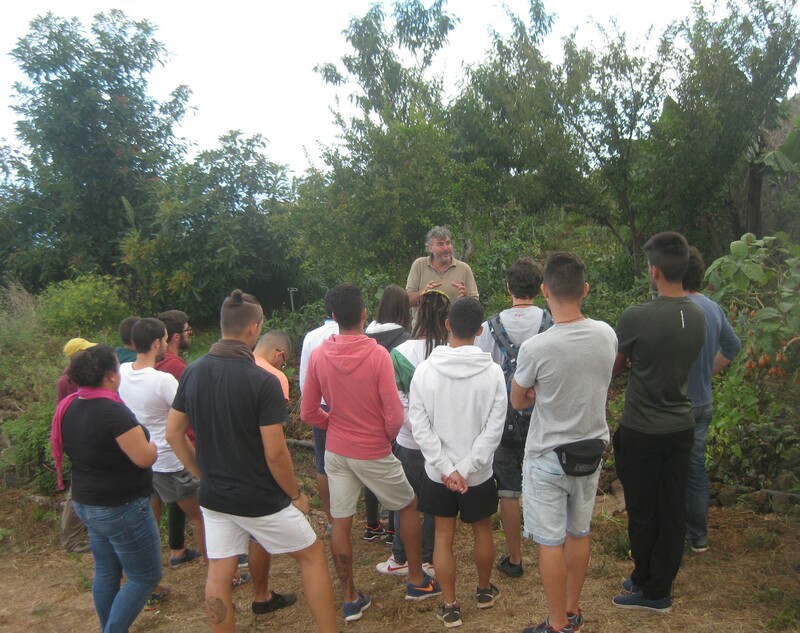 In order to choose the correct crops and trees, we consider information of the area, climatology and orientation we explained in the didactic unit “Designing the place”. 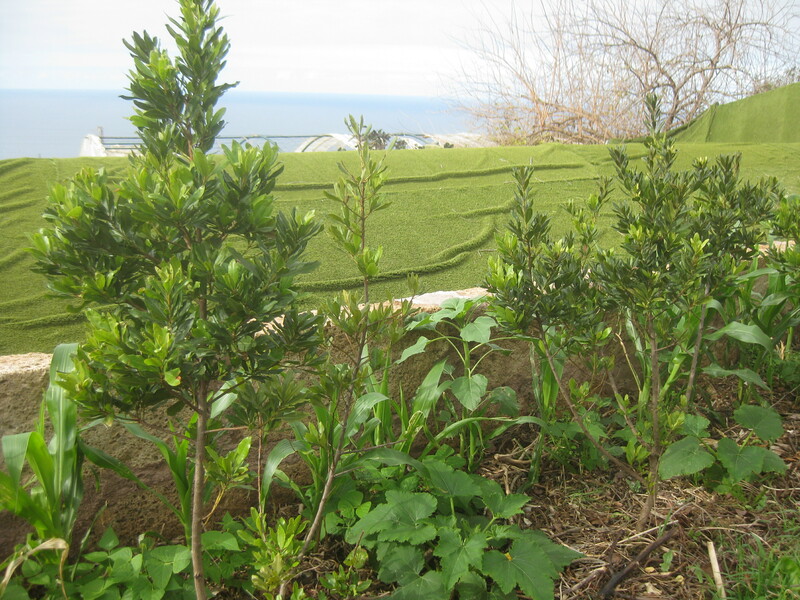 The evergreen grove from the U or semicircle shaped edible garden forest is formed by two parallel lines of trees: an outer line of hedges, as the one described in the paragraph “Hedges as borders for the ecosystems” of the didactic unit “Designing the place”, formed by indigenous evergreen trees and bushes, with a space between them of one meter or a meter and a half, that provide us with fruit and wood, that fix nitrogen, produce melliferous flowers and create microclimates; and an inner line with deciduous fruit trees, planted at a distance of 3 meters or more from the outer line of hedges, depending on the size of the treetops. 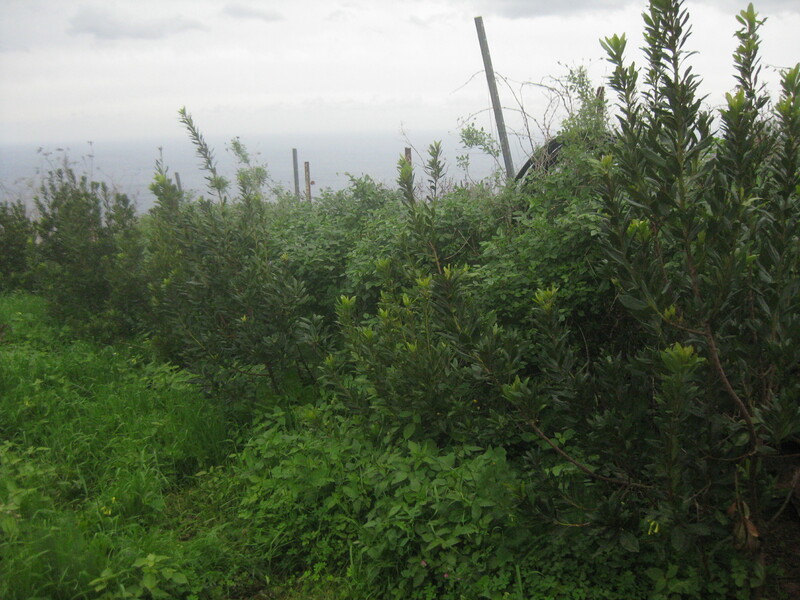 The evergreen fruit trees are planted at a distance of 3 to 4 meters between each fruit tree. 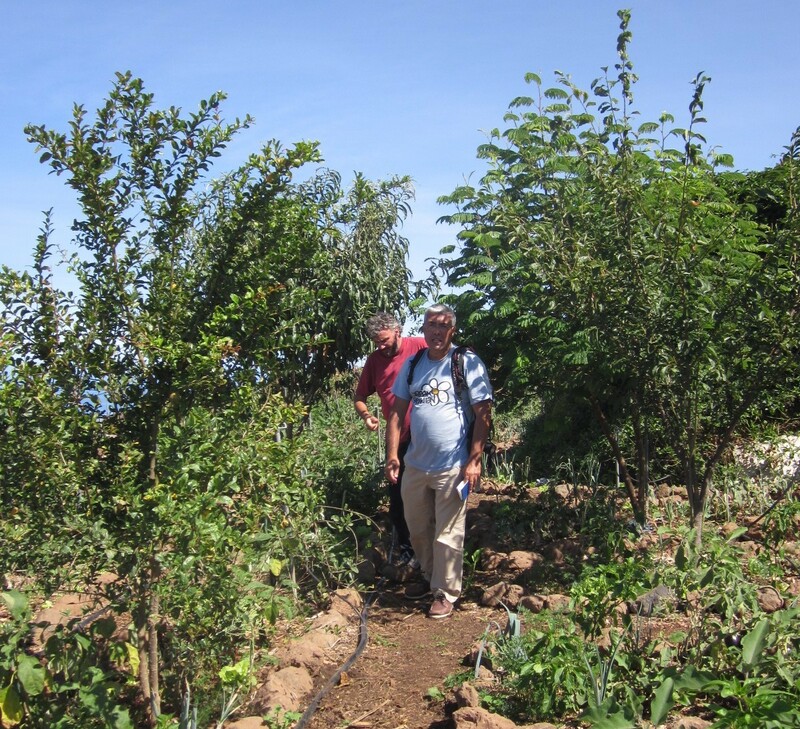 This way, they function as the border of the garden forest the same way the hedges do, forming a living barrier that slows down the wind and humidity and what’s more, the fruit trees restore and conserve biomass, improve the soil and produce food. 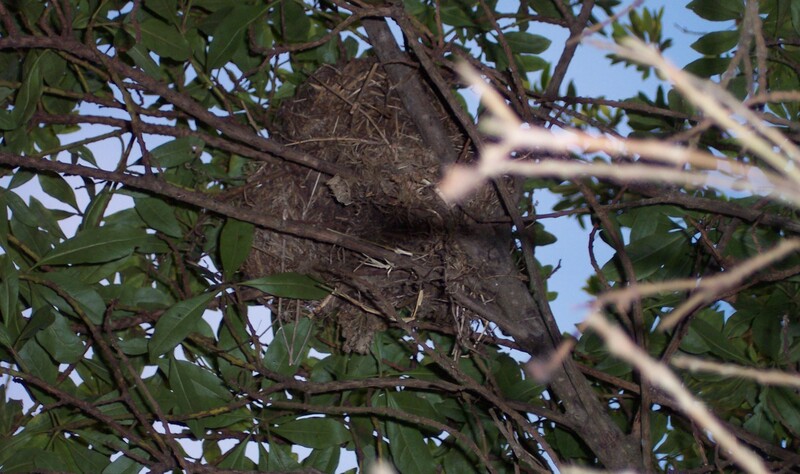 In our case, once the evergreen laurel forest from the hedges has experienced wind and humidity it becomes stronger, which allows the increase of the capacity for biomass, of fauna, and creates an environment that favours biodiversity in the property. It is recommended for the outer hedge to be lower than the evergreen fruit trees with the purpose of making it easier for the wind to rise up, and therefore affect less the garden forest. As we indicated in the didactic unit “Designing the place”, this evergreen grove area is ideal for incorporating biotopes. 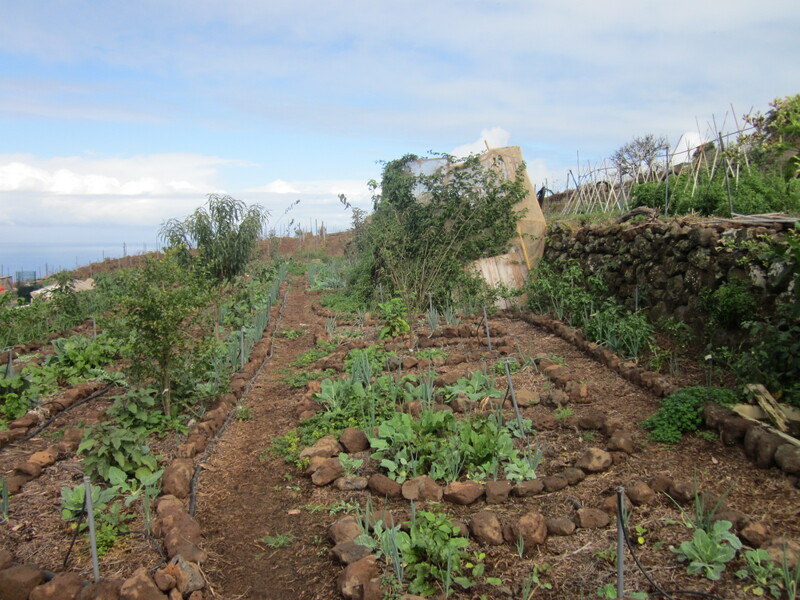 And, if we have the possibility, this is also a great setting to build a pollinator volcano by integrating it into the environment. 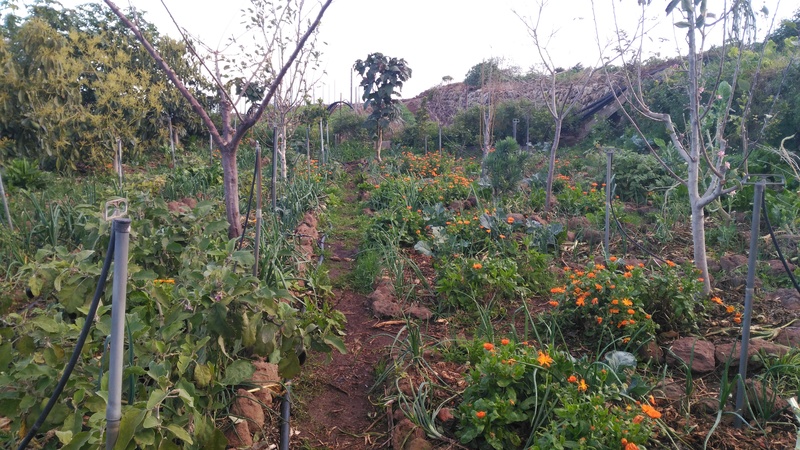 The remaining surface of the plot would be used for deciduous fruit trees, fruit bushes, small plants, edible and aromatic flowers and vegetables for eating and selling. 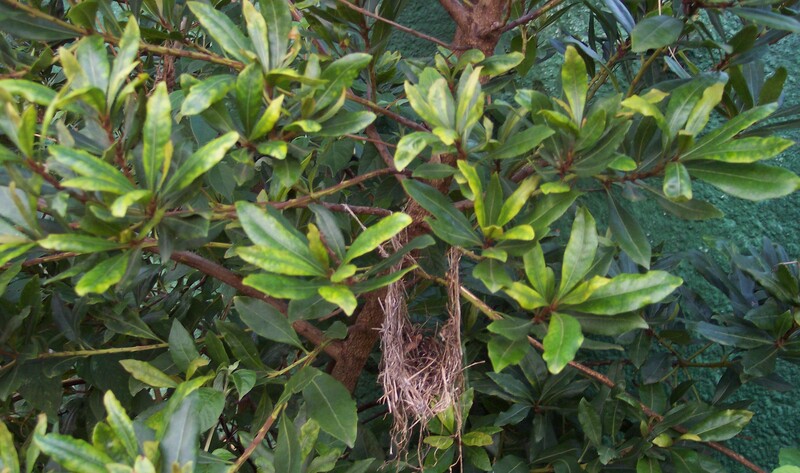 We would plant the deciduous fruit trees using the triangle pattern technique, at a minimum distance of two or three meters from the inside of the U or semicircle shaped evergreen fruit trees (Figure 4.4). 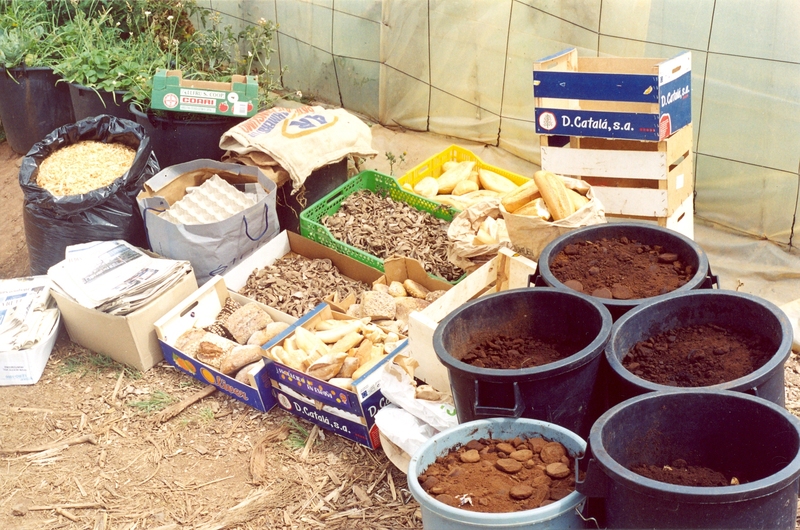 Figure 4.4 – Image showing the edible garden forest at winter. 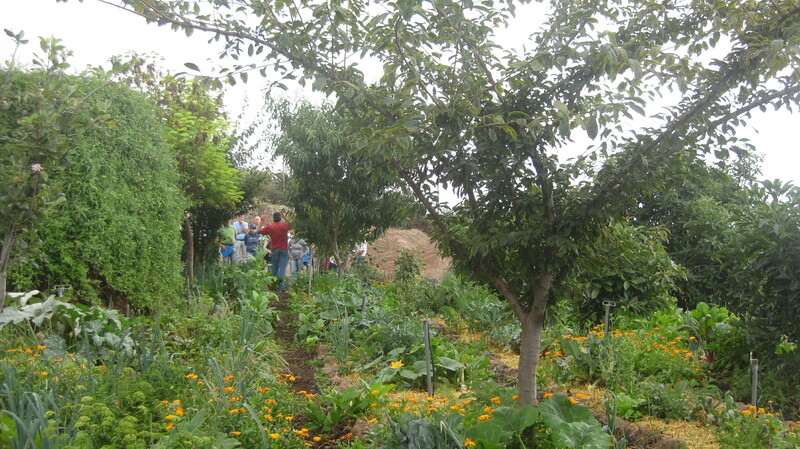 At the left, the back and the right side of the picture we can see hedges and evergreen fruit trees that are still small, and in the center, different deciduous fruit trees planted using the triangle pattern technique next to vegetables and edible flowers of all sizes. 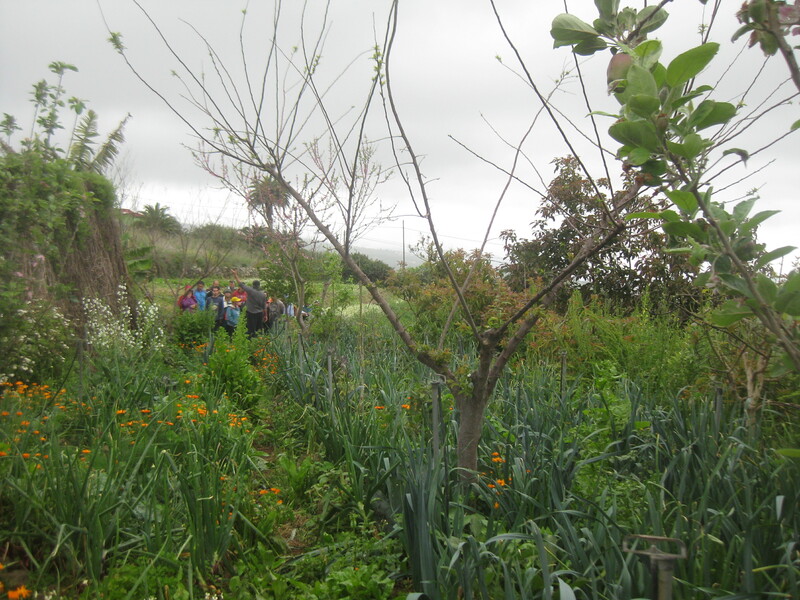 When it is time to decide the number of deciduous fruit trees we want to plant in the garden forest, it is important to take into account the characteristics and location of the domain: surface, hidden places, strong winds, the presence of mountains, the exposure to the sun, etc. 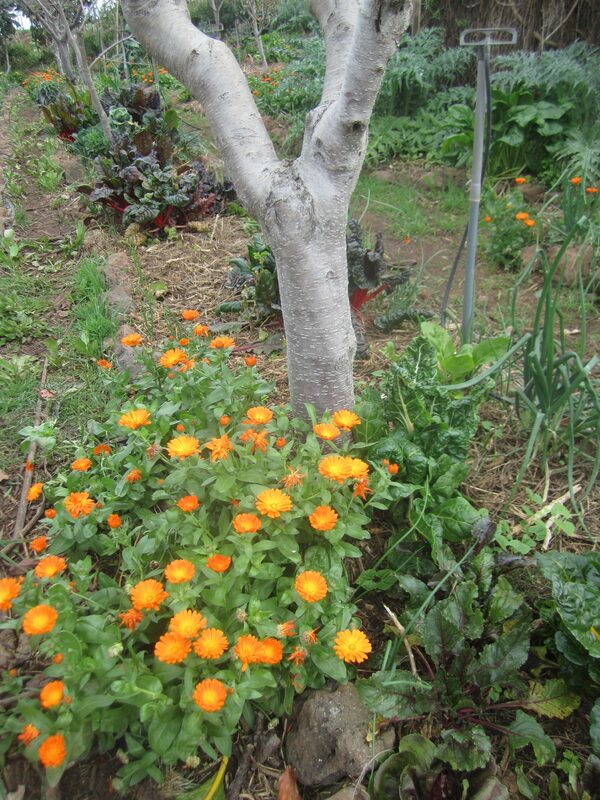 If the plot is very exposed to the sun we would plant more deciduous fruit trees than in the case of little exposure. 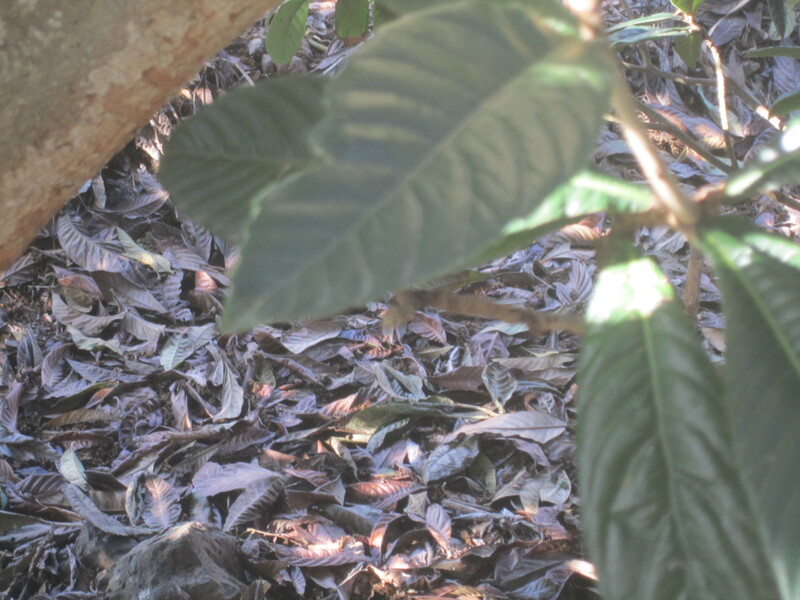 If the property receives a lot of sunlight it is recommended to plant the trees using the triangle pattern technique with a space between each fruit tree of 4 to 5 meters, but if it receives little sunlight the space between the trees would be of 6 to 7 meters (Figure 4.5). 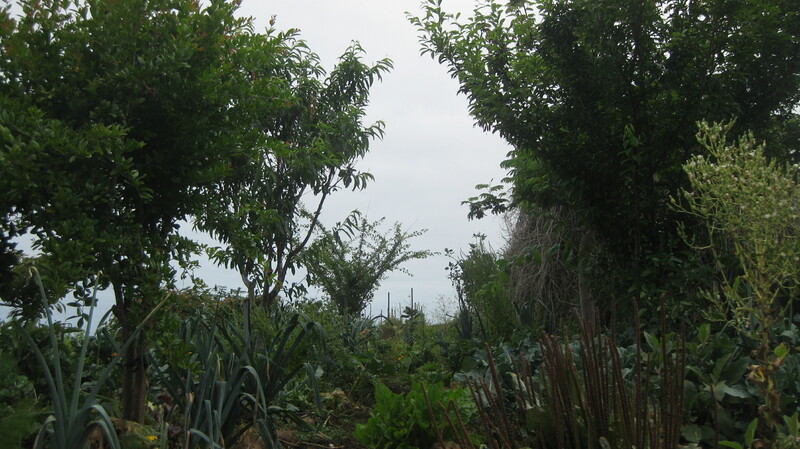 In case the plot is located in a way it needs as much sunlight as possible we can also choose not to plant any deciduous fruit trees. 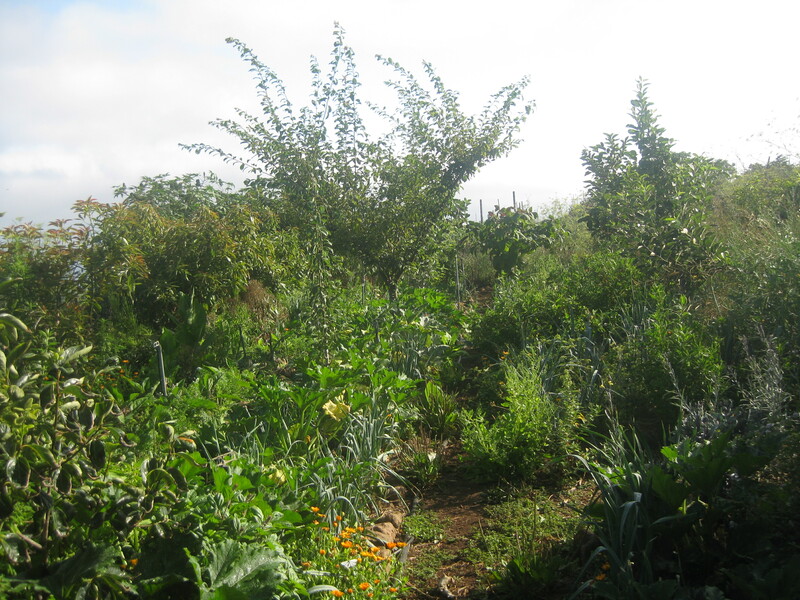 If this were the case, it would rather be called an edible garden instead of an edible garden forest. 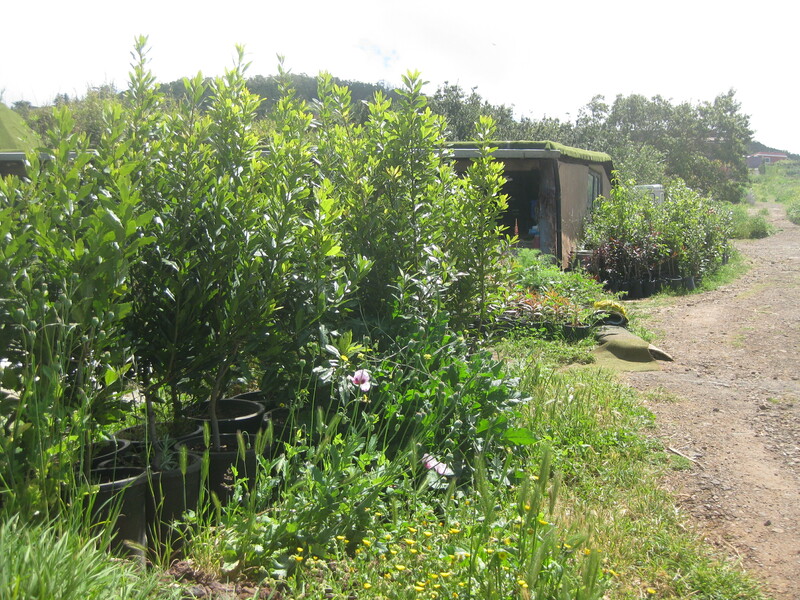 We would plant as many different varieties of evergreen and deciduous fruit trees as possible according to our area, and at least two trees of each variety to ensure fruit diversity in the different seasons of the year and to guarantee pollination of the varieties that need it (Figure 4.6). 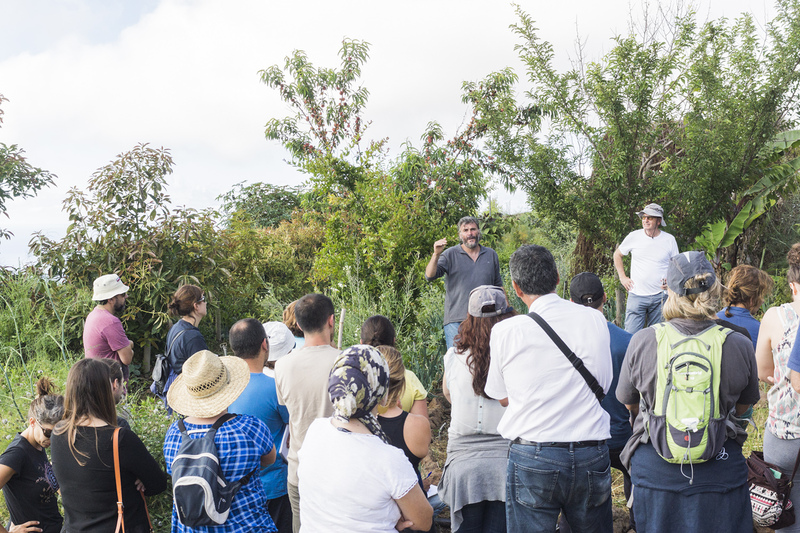 The strategy of the different distribution of the deciduous fruit trees compared to the evergreen fruit trees has the purpose of allowing the right amount of sunlight to reach the plants in every season. 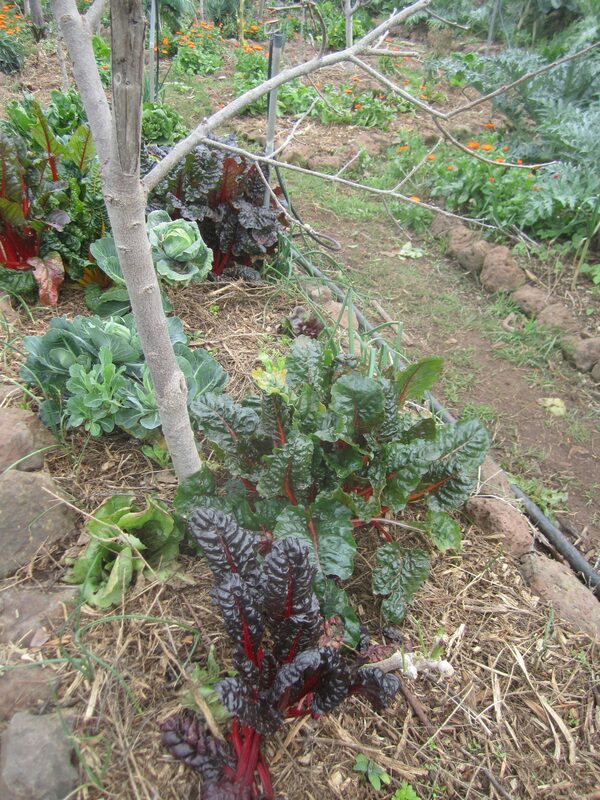 In autumn and winter, the inner part of the area with the deciduous trees and vegetables is exposed to all the sunlight and is also benefiting from the leaves that fall from the trees, restoring the soil´s skin with them (Figure 4.7). 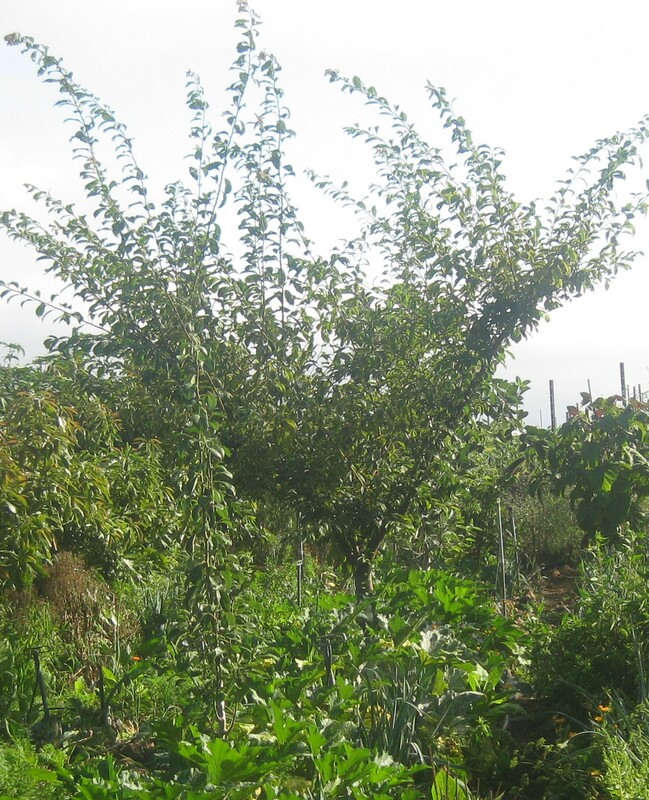 From spring to summer the deciduous fruit trees are full of leaves and fruit, which block the sunlight from reaching the ground under the trees, and therefore, some vegetables that need less hours of sunlight do not receive too much of it in midsummer. 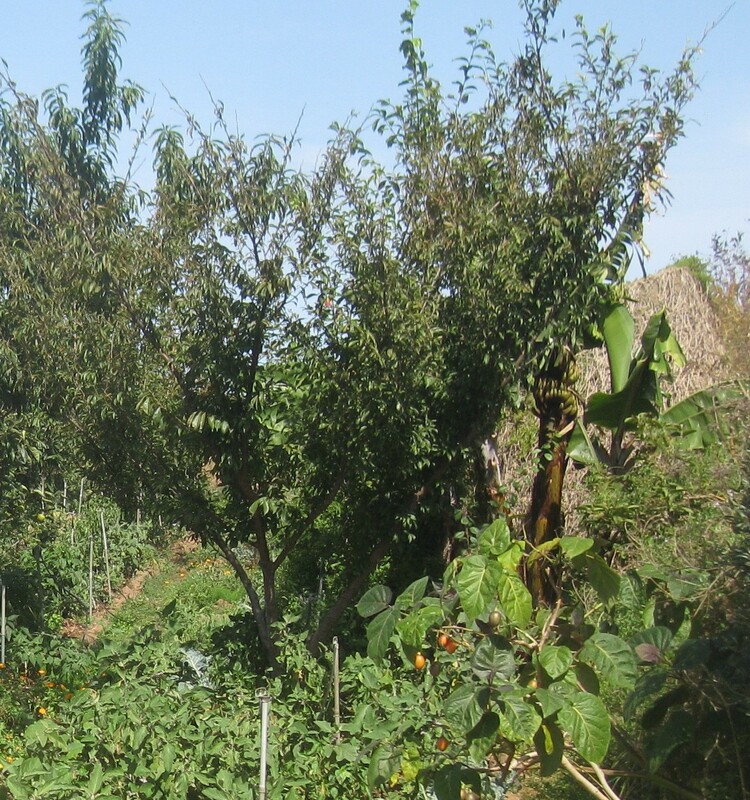 This avoids an early flowering of the vegetables due to the balance of sun and shade provided by the deciduous fruit trees at this time of year (Figure 4.8). 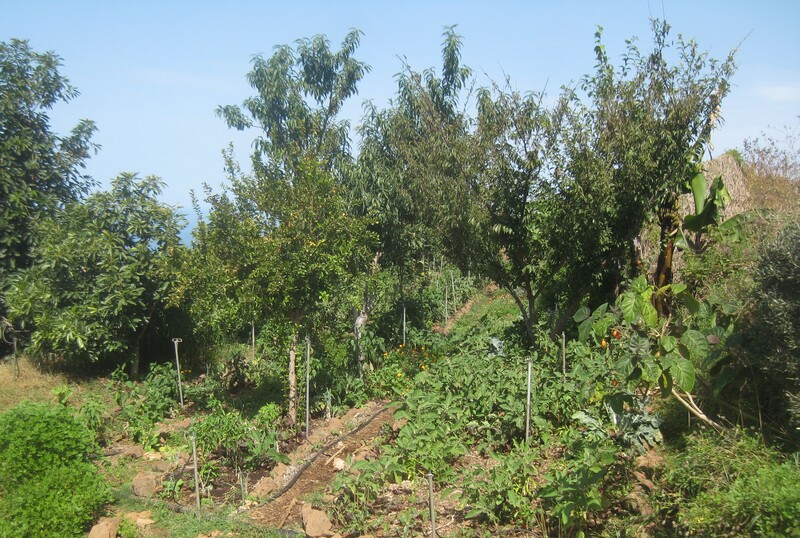 On the other hand, the evergreen fruit trees do not cause shade inside the vegetable area at any season of the year since they are not planted in the sunny area of the garden forest, yet they do constantly provide biomass and fruit during their season (Figure 4.9). 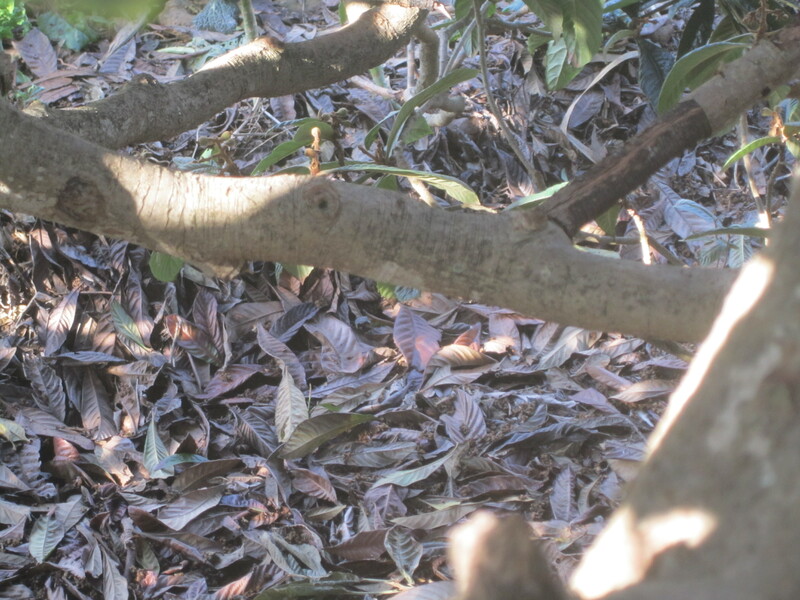 Even if the pruning of fruit trees in edible forests usually is reduced to a minimum, the pruning in our edible garden forest largely consists of maintenance cuts: we prune the low offshoots and suckers so the area under the fruit tree stays accessible and open. 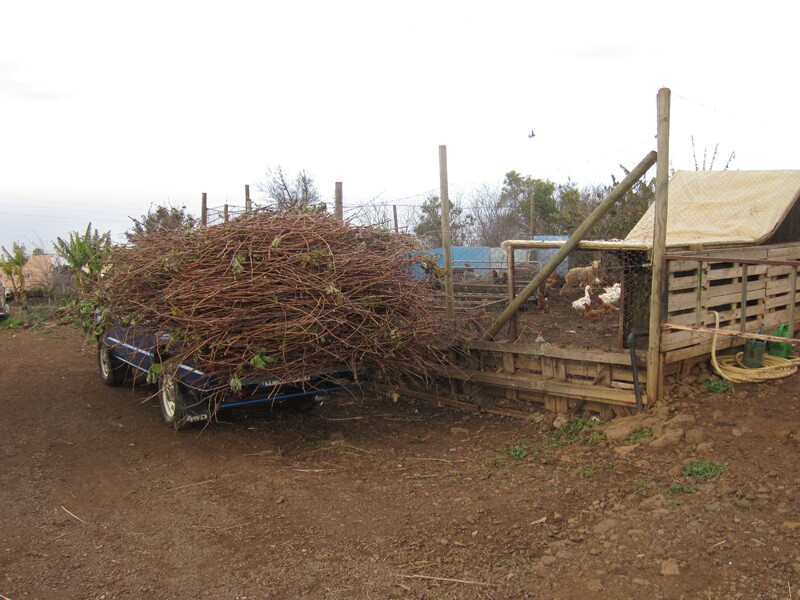 In general, intensive pruning isn’t necessary. 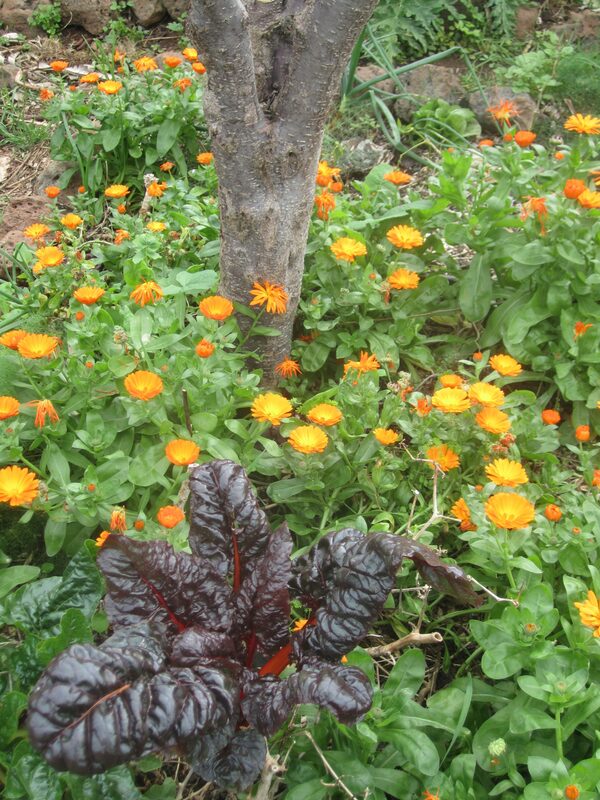 We can also choose not to prune. In our case we found out this works best for us. 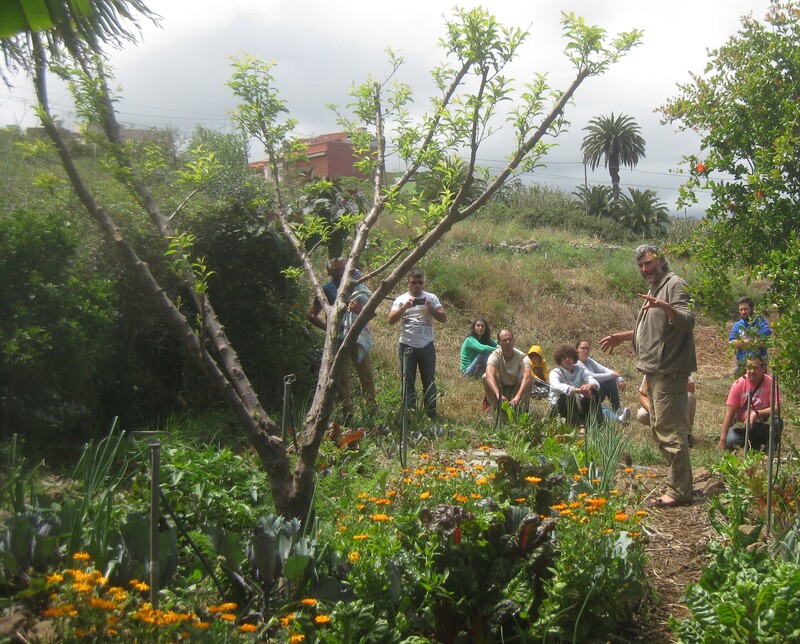 In any case, if you’re not experienced in pruning, it is advisable to follow a pruning course or workshop. 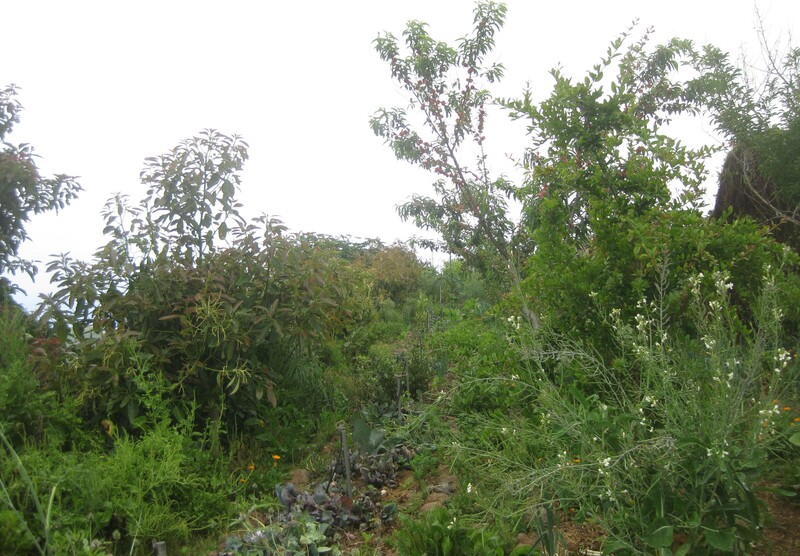 Figure 4.9 -Edible garden forest at the end of summer with 3-year-old fruit trees, evergreen ones at the sides and deciduous ones in the middle. 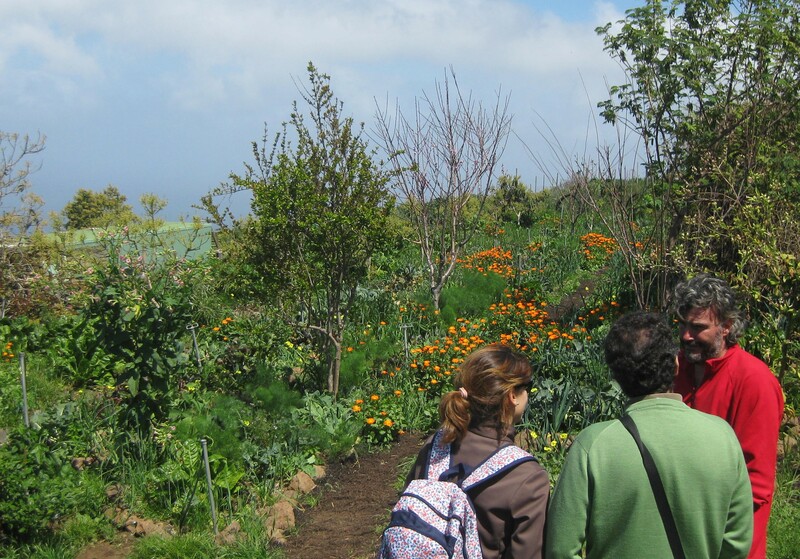 At the left side of the image the pollinator volcano is mimicked into the edible garden forest. 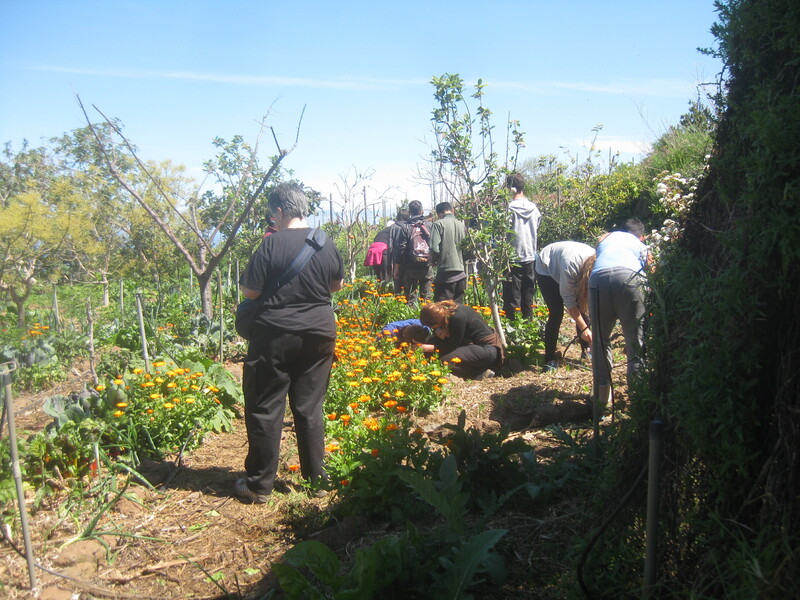 The people are at the sunny side of the garden forest, free of evergreen trees. 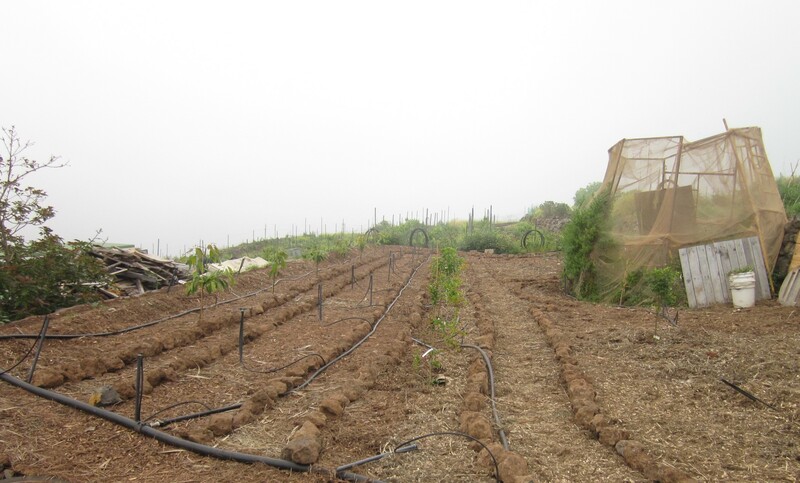 In areas where it is not possible to plant evergreen fruit trees due to the climate, we still have to plant indigenous evergreen trees that we can find in the wild nature, even though they do not grow fruits. They serve as hedges that protect the deciduous trees and vegetables of the inner part of the garden forest from wind and humidity. We will design the remaining space under and between the deciduous fruit trees the way we explained in the section “Drawing our allotments” from the didactic unit “Designing our edible garden”. 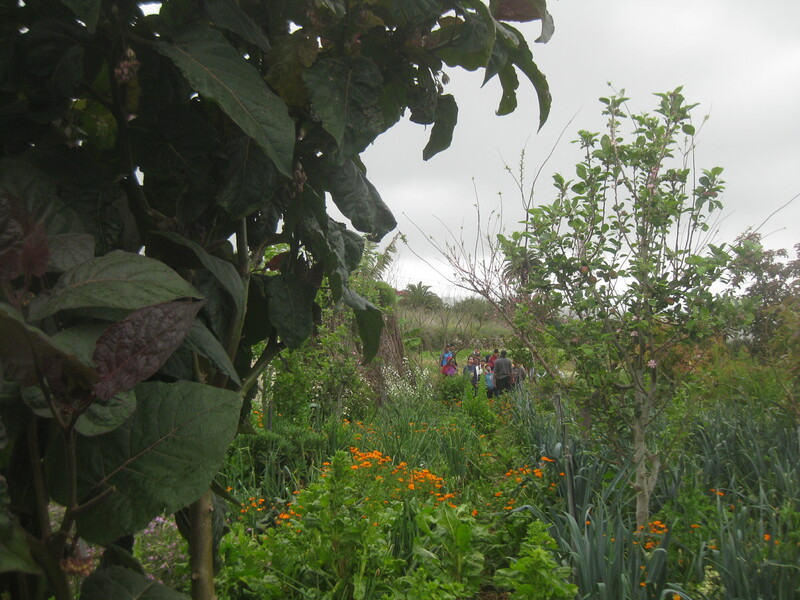 We will involve the students in this activity so that they create a design in which they can draw and create round shaped paths and beds that form mandalas in which we plant and sow a variety of vegetables and crops between the fruit trees (Figure 4.10). 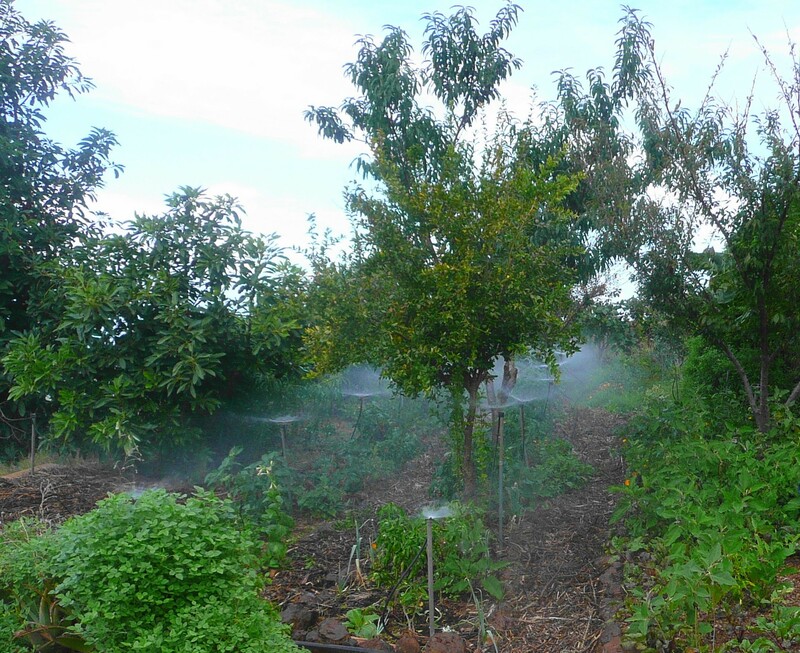 The irrigation systems, the design we chose and the maintenance tasks of the remaining space under and between the deciduous fruit trees are the same as in an edible garden (Figure 4.11). 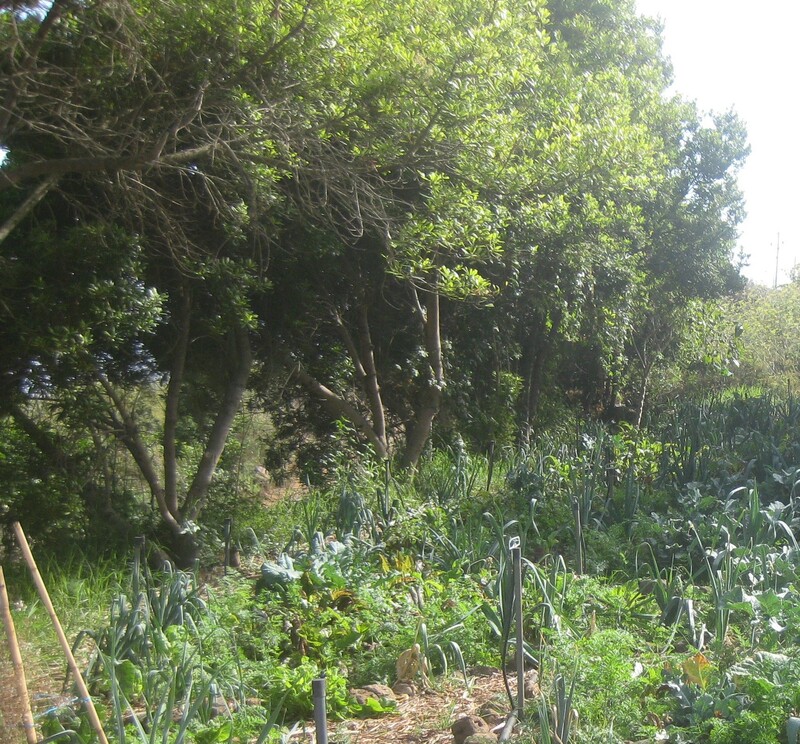 This garden forest model ensures us that the biobox that we create for selling can be filled with a big range of different vegetables and fruits that all result from a therapeutic and pleasant visiting area (Figure 4.12). Human beings have been able to destroy large areas of ecosystems and natural forests in order to create a production model based on monoculture, believing that we could end world hunger. This model has caused a great loss of plant and animal biodiversity, more poverty and has not solved the problem of world hunger. 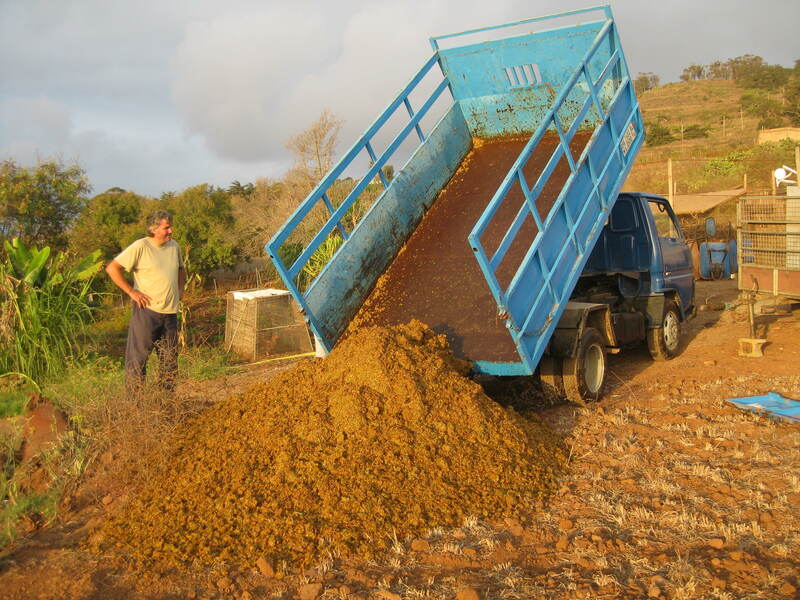 Knowing that we are also able to change this situation by rehabilitating and restoring the soil with the purpose of regenerating biodiversity, whilst at the same time also producing healthy food in a local environment, gives us hope. Finding natural sources, the pillars that support life such as soil and water may be the way of achieving the welfare and covering the basic needs of human beings, animals and plants. 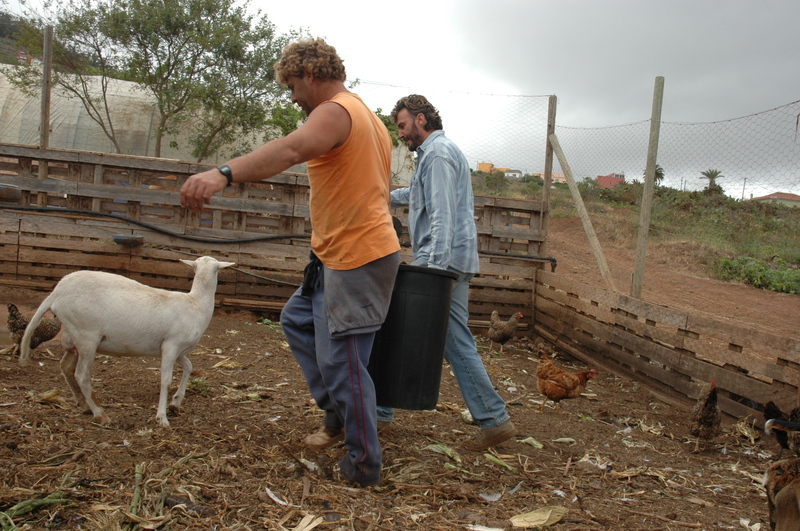 The charm of having a simple life might be the combination of ingenuity, survival instinct, and listening, observing and breathing what the natural environment has to tell us (Figure 4.13).